We’re starting to prepare to leave. Our rucksacks are out, and we’ve started, very slowly to give the apartment a little bit of a clean. We’ve abandoned the dusting. Dust accumulates very quickly here, guessing due to the pollution, so we’ve decided to leave the dusting until we come back and then give it a good cleaning. I’ve packed some clothes, unsure whether my old ones back home will fit me (I hope they will) and we’ve unfortunately had to unbox my nephews dinosaurs as they won’t fit in the backpacks. I’ve packed a big red T-rex in my one, and when you press a button underneath, the eyes flash and it roars. So I’m hoping when I pick it up from Dublin airport I wont be hearing roars coming from my backpack! Before we leave, we also have to finish the rest of the meat we have. We bought some mince beef a while back to make spaghetti with, but we still have enough to make another meal. I’ve had to make some yesterday, so I’m not too keen to make a another batch in the next few days. The heat from the cooking and the heat from the weather makes me become very very hot! And 3 days until we leave, but it hasn’t hit me yet! The night before I think it will. Thankfully our flight is in the evening so its at a good time; we can relax until we go. When we went to Mexico, our flight was at around 11am, so we had to leave our apartment at around 8/8:30am. At that time, the traffic was mad, and it was impossible to get a taxi as they were all full. Thankfully this lady stopped in a silver car for us and she brought us, (we were panicking, waiting 15minutes for a taxi outside) we presumed she was a private (illegal) taxi, but we didn’t care, thankful that she saw we were in desperate need! This time round we plan to get the bus to the airport as it will be cheaper. Hopefully everything will be ok and we arrive safe in Ireland! My stressful day at the hairdressers. It’s been 5 months since I last got my hair done! 5 months! I last got it done in Mexico, so before I head to Ireland, I very badly needed to get something done to it. At home I could get away with going every 2 months, so 5 was really stretching it. I’ve only got my hair done in China twice. The first time they charged me a huge amount of money, (because I was foreign) and it was literally orange. (Although they seemed extremely happy with it) So I didn’t go back to them. The second time was near my campus. They got the colour right and was cheap! Plus, they also initiated me as a ‘VIP’ client. Bring my card to them next time and I would get a big discount. So I thought I’d head back to the latter place, I am a VIP, I may as well make the most of this privilege. I walked in at 2:45…..leaving at 5:45!! 3 hours!!!! And one of the most stressful 3 hours I’ve ever had at a hairdressers! This has now made me even more scared to go to the hairdressers in China. Everything went fine at the beginning. My Chinese PA wrote in Chinese what I wanted, grand. They sat me down and did the colour. However, as soon as they finished putting it on, they whisked me over to the wash basin. I thought ‘This wasn’t like the last time, I spent ages with the colour in my hair’. But whatever, I did what I was told. So the colour was washed out and I sat back down again. They started drying my hair. I looked on my shoulder and I noticed my hair was sort of green blue. I thought it must have been the trick of the light. So I relaxed. Then, another few strands fell beside my left eye. I glanced, ‘God, It actually looks green/blue’. Then I started to panic, it actually was. I tried not to get flustered. Fortunately I had no mirror in front of me to look at the result. By this stage I was sweating, from the heat of the place plus the fact that my hair was ruined. All I wanted was a nice brown colour, nothing mad. I didn’t dare look around me; a foreigner with green/blue hair was bound to draw eyes. Three hairdressers were now standing around me picking up strands of my hair. I heard one say in Chinese the colour green. I thought ‘yeah it frigging is green! !’ I thought ‘How am I going to go home with this hair, I have to take a bus, subway and another bus home, which is 1 hour away. Everyone’s going to be looking at me’. But then I saw they started making a new colour up, Thank god I thought. Although I was still nervous that they wouldn’t be able to get the colour right. I was just surprised that the first time I went into them they got the colour fine. So they did the next one, all of this took over 2 hours; I think I lost about 3 pounds just by perspiring. Again, they took me to the wash basin and rinsed my hair. This time I knew they weren’t going to put another colour in, as they put shampoo and conditioner in. By this stage all I wanted was to get out of there, yet I still needed to dry and cut my hair! This time, they brought me to sit down in front of a mirror. I was nervous looking at my hair. I checked it over, no, no green. Thankfully it was ok, although the colour is nowhere near to the one I picked in the book. It looks exactly like the hair colour I had before, just with the roots done, although disappointed that It wasn’t the glossy dark brown I asked for, it was a big improvement to the previous green/blue. Then came the cut, which was fine. He did a good job with that. So all that only came to 148元. Or 20 euro….for 3 hours of work. . . . and two colours…. and me perspiring and stressing like a mad woman. God after that I don’t know if it was worth it. My thinking behind this hair disaster is that they are not used to foreigners hair. Chinese hair is obviously very black, and its quite thick, whereas mine is brown and quite thin. I think they use different colours here in China than back home, and maybe they don’t exactly know how to mix up the colours for my hair. So after all that, I’m more nervous than ever to go to a hair dressers here in China. Maybe next time I’ll look in Chengdu for a place that does foreign hair. Well, I’ll worry about that in another 5 months maybe. . .
Well semester one of Uni is officially over. Next week we have our exams and then we are finished until September. Unfortunately my character learning has slowed, well it’s actually at a stand still. I don’t know all the characters, but I decided not to stress about it. Theres no point in worrying over something that doesn’t need to be worried about. I’m not exactly under pressure to learn them, only from myself! So I do my exams, work the next few days, then Ireland! Or in Chinese 爱尔兰 ‘ài ěr lán’ . Ireland pronounced in Mandarin is very similar to the English pronunciation, as are many other countries. The Chinese just pronounce them phonetically. So ‘chocolate’, ‘bacon’ ‘pizza’ ‘hamburger’ ‘coca cola’ among others sound quite similar to English, check them out and you’ll see! Packing wise for Ireland, everything is shaping up nicely. We’ve gotten our euro’s, giving us 500euro notes which I was surprised about! But, easier to bring back with me. I’ve also bought some things from the internet so I have to wait for them to arrive. But apart from that everything is going fine. I’ve made a list for my Mum to cook us while we are there, and each day, it’s growing longer. I haven’t eaten my Mum’s food in like forever, so I want to make the most of our time at home by indulging her cooking again. God knows when I’ll be back, as I’m going to be broke when I return to China. Working part time does have it’s drawbacks unfortunately. In China, this weekend there is a festival; The Dragon Boat Festival. I’m not sure what it’s actually about, but I know the Chinese eat these sticky rice dumplings wrapped in bamboo leaves. I’ve tasted one last year and it was ok, not amazing, but ok. But I’m guessing there are many varieties so you just have to find out which ones you like. Usually during Festivals many students cancel, but so far, none of mine have yet to cancel! And I know for a fact one group will be coming on Monday. I’m guessing I’m such a good teacher that they really want to have English class. ha. But if they do cancel, that means I’m loosing out on pay, but then that equals more free time. It’s a catch-22 situation. But, if they choose not to come, I won’t be too disappointed anyway. So at the moment nothing too exciting is happening. Slowly counting my days until home time; Rafael is fed up of me showing him how many days we have left on my countdown app. I’m sure he can certainly figure it out himself. But, it gets me excited anyway! The only thing I’m worrying about is the weather. All I want is no rain. Maybe no wind either. I don’t mind if it’s cloudy and no sun, but just no rain. I’m not being too picky! If the sun does come out, then I’ll be extremely happy, but for now, just having the clouds ( and no rain) will do me fine. Getting ready for home time! In about 20 days we’ll be on our way to Ireland. Being away for 1 year and a half is scary! It’s flown by but also I feel like I missed loads back home. My nephew was 2 when I left, and he just turned 4 a few days ago. He’s a completely different boy now! Last time I could carry him about, but now, I’m definitely sure I won’t be able to do that. Plus with the added nephew it’s going to be extra strange coming home to another addition to the family. So, I’ve started to slowly get stuff ready for going; with Uni and working, we don’t get much time to do stuff. We’ve bought our tickets to both Ireland and France, booked our accommodation in Paris, so now we have to organise our money situation and see how much we should bring. My 4 year old nephew has also not been letting me forget about what he wants! Specifically dinosaurs. He also added that he wanted a train and gates so he can put the dinosaurs in it. That request was a little to difficult for me to achieve, but myself and Rafael bought him about 9 dinosaurs, 8 that are stationary and 1 that is bigger and moves. So I hope they will make him happy! As for my other nephew, because he’s only about 4 months old, he’ll have to settle with a hand made (unisex) cardigan from Mexico. When I think of the souvenirs I brought from Mexico, it made me realise where did I actually put them. Since moving, I haven’t seen them around the apartment. I’ll have to dig them up too so I can give them to my family. Food wise for Ireland, I did tell Mum to make her special omelette for when we arrive, but I’ve suddenly changed my mind, going for a typical Irish breakfast! We’ll arrive in the morning so it’ll be the perfect breakfast! I realised; we have eggs and the ingredients here, so we could make our own omelette if we wanted to, whereas with an Irish breakfast it’s impossible to make here. And University wise, we only have a few weeks left until semester one is finished! The amount I’ve learned is amazing, so I hope I’ll learn lots more in level 2. I think I could comfortably do the HSK level 1 exam now. This is the Chinese language proficiency exam for foreigners. I know, I know, I did say months ago on this blog that I was planning on doing the exam for ages. But I got lazy, and wasn’t actually sure If I could do it. But I think maybe we could do it after we come back from Ireland. For now, I’m concentrating on learning the characters from the first book. I’ve calculated that I need to learn 10 characters a day in order to know them for the exam. I don’t think I’ll know them all, though, as I tend to forget how to write them very easily. But I have all summer to make sure I know them for level 2. When I get that backpack out then it’ll really be time to go! 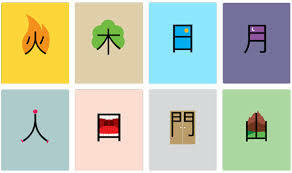 火 fire, 木 wood, 日 sun, 月 moon, 人 person, 口 mouth, 門 door/gate, 山 mountain. With the end of semester 1 looming, talk of our exams are beginning. During my lifetime, I’ve had to do countless exams, so fortunately for the upcoming exams, they will have no effect on us with grades. Because this isn’t a degree awarding course, it doesn’t matter if you don’t do very well. The tests are mainly to show you what areas you need to improve on, and if you feel fit enough to move up a level in the next semester. So with this in mind, I’m not worrying too much. Not much is known about the exams, only that there is a speaking, listening and a writing part. This week, one of our teachers has been testing us on our chinese characters from each chapter. I’ve been hurriedly trying to write and rewrite them before the small test. My problem with characters is that, although I can read them, I can’t write them. Easy ones like 我, (I) 你，(you) 他，(he) 是，(is/are) 有,(have) are ones that currently crop up, so I know these. It is the ones that I don’t write down often enough that are the problem. Say for example the phrase ‘我有一张地图’。 ‘I have one map’. I always struggle to remember how to write 地图，’map’. No matter how much I write it down, I still seem to forget. I think for our test, if we don’t know the character we can write it in pinyin, as I know quite a lot of people aren’t sure of the characters. When I am around Chengdu, I try and look out for any I know, which for me is a problem. With the amount of fonts here, they look completely different, making it very difficult for me to distinguish one from another. Anyway, even if I did know how to read it, it would most likely mean a completely different thing altogether. classifier for flat surfaces such as drums, mirrors, flags. So, I don’t actually know this character at all. This is what makes learning hanzi difficult. My plan is during the summer learn all the hanzi from my current book so I’ll be ready for level 2 and I won’t be bogged down with learning both level 1 and 2 together.